This Jamaican-Style Pressure Cooker Oxtail Stew is sure to be a hit. With the warmth, the heat, and the sweetness we love - it's perfectly balanced. Add salt, pepper, and brown sugar to mixing bowl. Whisk them together, making sure to break up the brown sugar. Add oxtails to mixing bowl and toss very well, making sure each piece is evenly coated with seasoning. Turn on sauté setting. Once hot - add oil, then add seasoned oxtails. Take your time with this and brown thoroughly on each side. Meanwhile - add scotch bonnet, thyme, and allspice berries to cheesecloth and tie with kitchen twine. Once oxtails are fully browned, set them aside in a large bowl and cover with foil. Don't you dare wash out this amazing fond! Add onions to pot and use them to deglaze the bottom, making sure to scrape up all the brown bits. Then add ginger, garlic, and half of the green onions - cook for 2 minutes or so. Add Worcestershire and continue cooking for a minute or two. Return oxtails to pot along with beef stock and cheesecloth (on top). Lock lid and cook at high pressure for 45 minutes. Once cook time is complete, allow pressure to release naturally (about 30 minutes). 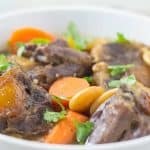 Carefully remove oxtails and set them aside in a large bowl. Cover with foil. Pour sauce through a fine mesh strainer into a large bowl, then return liquid to pot. Discard cooked ingredients. Add carrots, butter beans, and remaining green onions to pot. Lock lid and cook at high pressure for 4 minutes. Meanwhile - make a cornstarch slurry. Once cook time is complete, quick-release pressure. Then switch to sauté setting and bring up to a boil. Add cornstarch slurry to pot and cook until desired thickness (we did about 3 minutes). Then return oxtails to sauce.